Are you the new winery in Pittstown? No, we’re the old winery in Pittstown. We started in 2005, have remained small by design, and built our reputation almost exclusively by word-of-mouth. We enthusiastically support all new vineyards and wineries that are committed to growing high quality wine in the Pittstown area, which we believe will become a key wine destination just 50 miles east of Manhattan. There are two today; we need another twenty. Let’s just say we’re low-key. Artisanal winemaking is humbling, tied inextricably to the weather and other whims of nature, prompting us to allow our wines to speak for themselves. If they’re any good, people will find them. This is why we didn’t bother with a website until our 10th growing season (2014), and there’s still no sign in front of our winery, or even on our winery. Many of our best customers say they prefer it that way. 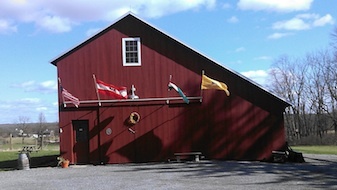 What’s up with the four flags outside your winery? We used to fly only the Austrian flag, since most of our vines are of Austrian origin (our family name, Leitner, is too but that’s just a coincidence). We added the Hungarian flag because many Austrian grapes also grow in Hungary and some may actually be Hungarian (like the winemaker’s wife). We then added the American flag so the winemaker’s children would understand that they were actually Americans, not Central Europeans. Finally, we added the Polish flag in honor of the many Poles whose integrity, work ethic, skill and dedication helped us create this from the ground up. How can I sample your wine? We offer impromptu tastings at our winery every Friday, Saturday and Sunday from 12 noon to 6 PM, when you can sample “splashes” of five wines, a flight of three wines, or by-the-glass (all totaling 5 fluid oz.). You may also taste by appointment at a mutually convenient time, at one of our private tastings or at various events held throughout the year. Why don’t I recognize some (or many) of your wines? We planted grapevines we believed would thrive in our climate and soils, rather than the most popular ones, because we aim to make the best wine possible here. A poor example of a familiar wine is not our goal. And while introducing unfamiliar wines to our customers takes extra effort, so be it. Therefore, our estate plantings are almost exclusively Austrian, with names like Blaufränkisch, Zweigelt and Grüner Veltliner. Some of our sourced grapes are perhaps more familiar. How can I buy your wine? You may purchase our wine either by visiting our winery, calling us at 908-735-9359 or emailing us. We can ship by UPS (minimum shipment is one 750 mL bottle). Do you sell your wine online? We gladly accept orders initiated through an email or telephone call. We ship easily to addresses within the State of New Jersey, and upon request will determine the feasibility of shipping to other states. Email or call us at 908-735-9359 to find out. Do you sell your wine in restaurants, liquor stores or wine shops? At present we sell solely through our winery near Pittstown, New Jersey. We make small quantities of each wine, much of which is reserved by subscribers while it’s still in barrels, leaving even smaller amounts that most restaurants and retailers won’t bother with. As we grow, this may change. What is a subscription? How can I get one? A subscription reserves wine before it is ready for release. This ensures that you get what you want, particularly if the wine is made in very small quantities, is in high demand, or both. Another benefit is the wine is usually reserved at a price below the expected release price. Each subscriber is issued a number based on when they first subscribed, and this determines how wines are allocated each year. Subscriptions are usually offered early in the new year once the prior harvest’s wines begin to take shape. Contact us or see Subscribe if you’re interested in learning more. What is a private tasting? It is a signature Mount Salem experience: 6 wines tasted by up to 8 people over the course of 90 minutes, led by the winemaker in a private room in the wine barn or the farmhouse. This allows you to delve into a manageable number of wines so they may be compared, contrasted, debated and ultimately enjoyed. A modest food pairing is included, and can be expanded with a supplement. All private tastings are offered by appointment. We do, albeit selectively. We can accommodate up to 50 people indoors and – from May through September – up to 100 outdoors. While many venues are available in the Hunterdon area, our offerings are appreciated most by a sophisticated clientele seeking an authentic family farm winery experience. Set on a historic farmstead, with foods carefully paired with our wines, this is a place that some find just right. LongTable is the name of the outdoor harvest dinner we’ve hosted in our vineyard since 2007. 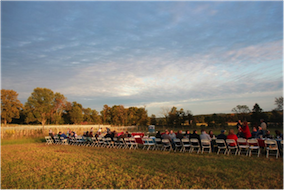 One-hundred guests sit at one long table to celebrate the local bounty and their ancestry. Each guest brings a dish for this communal meal, with two requirements: the dish must reflect their heritage and it must contain at least one locally-grown ingredient. For the most recent LongTable menu, click here. Why all the emphasis on food around your wines? Because wine is a food or, as Clark Smith likes to say, it is the ultimate slow food. Indeed, a good wine may be defined as one that tastes better with food while also making food taste better. For these reasons, we offer a variety of events, programs and activities that elevate wine above a mere cocktail or beverage. Why are prices at small, local wineries often higher than for wines sold at a liquor store? The vast majority of wine (measured in volume) is mass-produced in huge wineries that look more like sprawling refineries and tank farms than quaint wine barns in rural landscapes. The grapes used are usually mediocre and often surplus (i.e., bought on the spot market) before they’re transformed by impressive technology with few human beings or oak barrels involved. Indeed, more than a little of that wine is sold-off in bulk, at or below cost, to make room for the next vintage. That’s one of the reasons why the average retail bottle price is around $10.00: it’s mass produced for a mass market. Small local wineries couldn’t be more different, especially those that grow their own vinifera grapes in an unforgiving climate like the Eastern U.S. Why? The size and quality of harvest varies tremendously from year to year due to our climate. Economies of scale that allow cheap winemaking are infeasible because vineyards here are small, so most work is done by hand by people whose skills take years to learn and who are difficult to replace. The price of real estate here is very expensive, and does not include the cost of the vines, trellis, fencing, and other land improvements. Finally, the cost of legal and regulatory compliance for a small winery is the same as a large one, making it stunningly burdensome. So, add these factors together and a small artisanal winery, to be viable, must price its wines well above mass produced wines. It must also, of course, create high quality and sought-after wines to justify it. Please support your local winegrower. How did you learn to grow grapes and make wine? We are proudly self-taught, yet humbly acknowledge the community of farmers, grape growers, winemakers, extension agents and others here in New Jersey – include several true winegrowing pioneers – who’ve mentored us. Our successes are theirs; the failures are ours alone.